I'm a big fan of baking, even more so when there's a seasonal event coming up like Easter, Halloween or Christmas, it just means I can be all the more explorative with my edible themes! 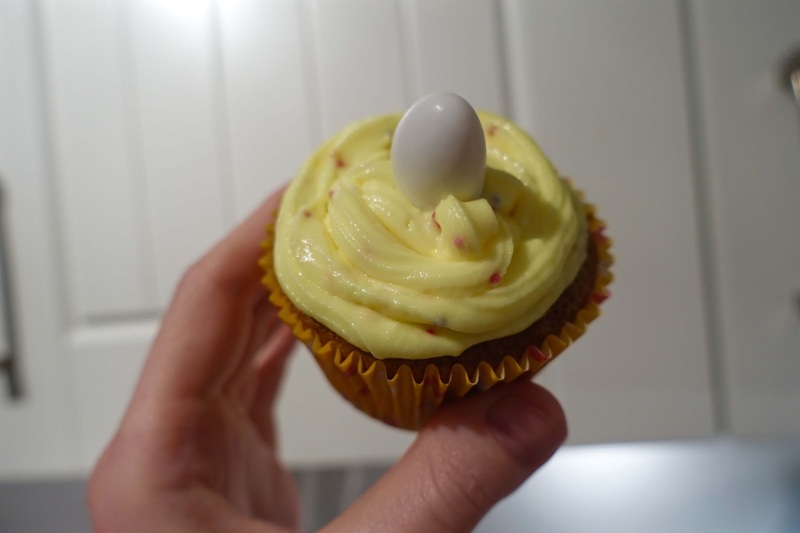 So when Bake with Maria got in touch regarding a Easter cupcake recipe in collaboration with Lavolio Boutique I was keen to get involved! 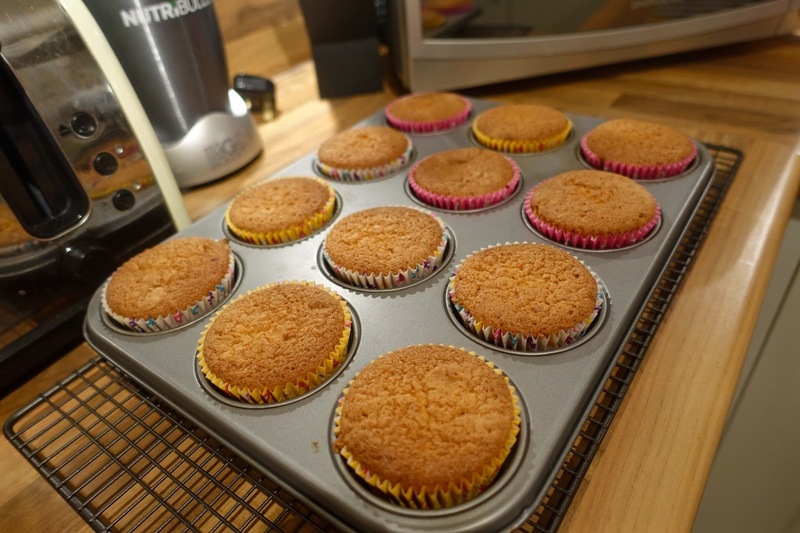 To give you a little bit more background; Bake with Maria run intimate baking classes from the heart of a baking lab located in London's, St Johns Wood. Unfortunately, I haven't been able to attend a baking class myself as of yet, however after a little bit of browsing online I've noticed they offer a 'macaron making class' taught by confectioner; Annamarie Jones which would be right up my street! (excuse the blog pun). Macarons are a firm favourite of mine, I've consumed many-a-macaron in my lifetime, however have never actually made my own batch.. how would I manage to get them so perfectly round and smooth? I'd love to know how to perfect the art of this delicious french delicacy. Within this Macaron Baking Class they'll show you how to craft the 'perfect macaron', while making some very indulgent flavours of chocolate salted caramel and passion fruit and white chocolate. 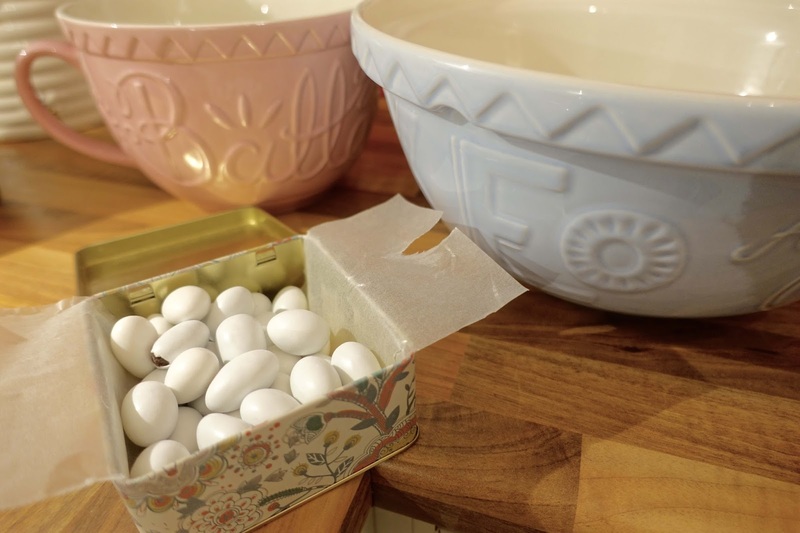 In particular for this sweet-treat recipe, Bake with Maria have worked with Lavolio Boutique to create something special with the use of Lavolio's truly scrumptious Easter egg treats! Lavolio were kind enough to send me some of their Nutty Easter Eggs (*) to sample, and include in my easter cupcake recipe. Inside each delicate white egg is one of three chocolate flavours – either Extra Dark Chocolate, Hazelnut Gianduia Chocolate, or White Amaretto Chocolate. Below is the recipe I used in order to create these perfect little treats for the Easter weekend! Sieve together the flour and caster sugar and bicarbonate of soda in a bowl. Add the soft butter, eggs, lemon juice and the lemon zest. Beat for 1 minute at medium speed. Add the milk and beat for another 30 seconds. Scrape down the sides of your mixer and beat for another 30 seconds. Time to fill your cupcake cases! 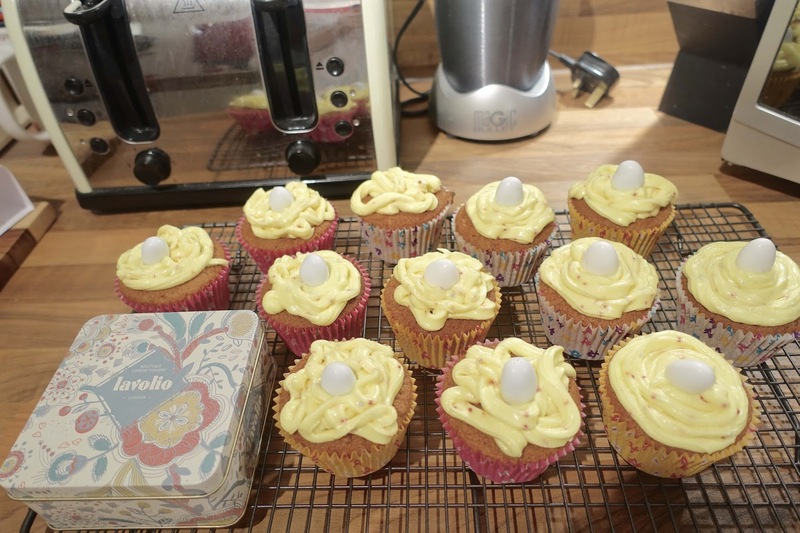 Fill ⅔ full and drop one or two Lavolio Easter eggs in to each cupcake (depending on how many you have left - I ate quite a few of mine before hand). Then bake for 20-25 minutes until a cake skewer comes out clean. Let them cool off completely before decorating them with cream cheese frosting. The original recipe includes cream cheese, however I don't like cream cheese so just did a normal buttercream icing recipe. Beat the butter with half the icing sugar until pale and fluffy. Scrape down the bowl well, add the rest of the icing sugar and beat again until pale and fluffy. Add in the hundreds and thousands sprinkles and mix in well for an even coating. Add 2 or 3 drops of the yellow food colouring and mix in well. 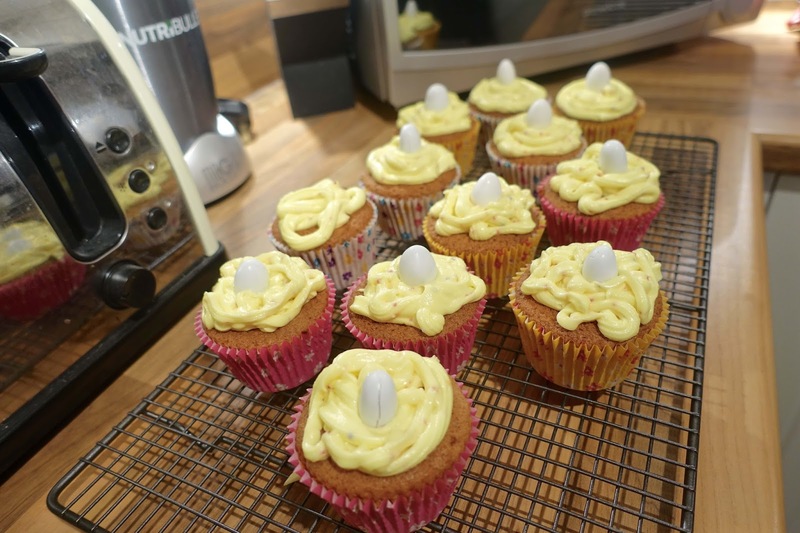 Ice the cakes (I did this using a piping bag for a swirly effect) once they are completely cool and decorate with whatever Lavolio Eggs you have left! 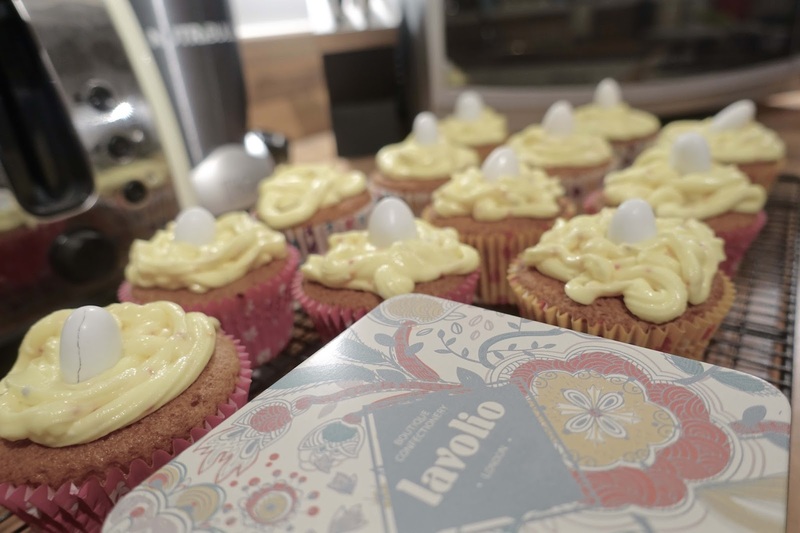 Eating these cupcakes was even more fun, especially with the added 'surprise' of the Lavolio nutty eggs tucked away inside each cupcake - this gave each one a delightful crunch! Now get some friends and family round and serve up these scrumptious easter cupcakes with a hidden surprise inside! love this post, it was lovely!